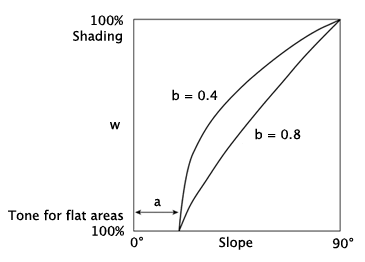 Areas with a slope below a are fully covered by the assigned bright tone for flat areas. Parameter b determines the influence of this tone. The following figure illustrates the effect of the two parameters together. As an alternative to the above function, a program may offer an interactive dialog to adjust the weight as a function of slope at a more detailed level. Additionally, the influence of the flat tone can be limited to areas below a certain elevation. With lightening tone for flat areas.